My mentor and hero in opera was Jerome Hines, the great bass of the Metropolitan Opera and the greatest bass America has ever produced. Not only was he my mentor but we became very close friends, as close as Jerry could get to people. Jerry was born in L.A. to a socialite mother and an alcoholic Father who worked in low level Hollywood productions. When Jerry was born the parents thought they had no time for a child so they sent the infant Jerome to live with a foster family. Jerry grew up the first five years of his life thinking the foster parents were his real parents. Then, when he was five, his real parents showed up and said, “Hello we are your real parents and you are going to live with us now.” Can you imagine? He said it was like hell living with them. They were always fighting. The father was always drunk and in and out of jobs. The mother was over protective and smothering. But by the time he was 16 he discovered that he had a voice and could sing. At 17 he became a student of Gennaro Curci, a famous voice teacher who had been an operatic bass and the brother in law of the famous soprano, Galli-Curci. The rest is history. Jerry signed his contract with the Metropolitan Opera when he was 25 years old and went on to become the greatest bass America ever produced. In the 1950’s and 60’s he was a household name in America, appearing on TV and singing for the first family many times. He was the first American ever to sing at the Bolshoi in Russia, at the height of the Cuban Missile Crisis. After his performance of Boris, Krushschev came back stage and gave him a secret message to give to President Kennedy. When he arrived back in New York he was quickly taken away by secret service officers for debriefing. He had to sign a national security non disclosure document never to speak of what he was told. But over the years he told us the gist of the message. Kruschev wanted Kennedy to know that Russia would not go to war over Cuba. Jerry remained at the Metropolitan Opera as leading bass for 41 consecutive years breaking all time records for a lead singer. 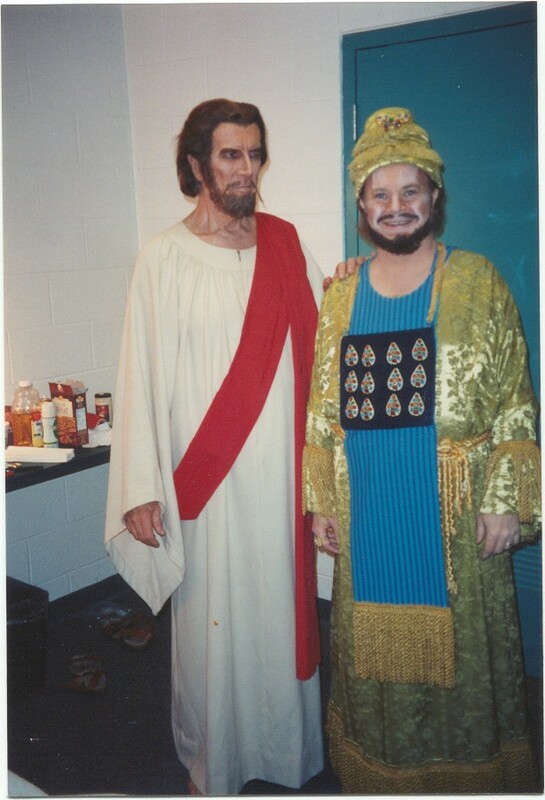 He also had his own opera company which he used to perform his sacred opera on the life of Christ, called I Am The Way. He chose me as a leading baritone with his company in 1976 and I stayed with him until 1997. He dedicated one of his books to me. His wife, Lucia, contracted Lou Gherig’s disease and he spent his later years nursing her and spending every dime he had on her treatments and nursing. He said to me one day, “Do you know a good witch doctor? I have tried everything else.” At that time I didn’t. But now, I could tell him to take her to John of God who has cured people with the same disease. Lucia died in bed with him one night. Jerry was never the same. He was broke, could hardly sing anymore and there was a double mortgage on his house. He only had a few students, one of which would bring him food, because otherwise he did not eat. One day he asked his student Les, if he would take him to the Vet to buy some food for his old dog. Les agreed and off they went. Jerry went in the store and picked up a bag of dog food and went to the counter. He opened his wallet and just stared into it. Les quickly saw what was happening and went to the counter to pay for it. “It’s OK Jerry. This is on me.” They took the food and went back to the car. Jerry began to cry. “I never wanted you to see me like this,” he said to Les. Jerry would often call me during those days and wanted to talk with me about his career. He could not make the adjustment from being one of the greatest operatic basses in the world to being an old man who couldn’t sing anymore. Over and over he would ask me to tell him if he had really been a good singer. Over and over I would tell him he was one of the greatest basses of the 20th century. Then his threatened ego would come in and ask me to tell him, “Well, was I the greatest bass of all time?” His ego could not adjust either. Patiently I would tell him, “You were one of the greatest basses of the 20th century, Jerry.” For a while that would hold him, and then we would go through it over again in a few minutes. I couldn’t know then how he felt. At the time I was still in the prime of my voice and I expected to sing into my 70’s as he had. In the fall of 2002 Jerry became quite ill. He looked like a skeleton but he was still talking about singing. On Christmas in 2002 he went to the Salvation Army in New York where he had worked for years as a volunteer, and stood up to sing. People who were there said that this tall skeleton of a man, looking like father time himself, hobbled up to the podium. But when he opened his mouth, out came the voice of Jerome Hines. Shortly after that he was hospitalized and within a short time, passed over. He had used every ounce of his talent. He had traveled through the storms. I felt enormous loss when he died..and still do, but I did not feel what he felt about losing his ability to be on stage until 2006 when I had a disastrous heart surgery, during which the surgeons made errors which damaged my lungs, disabling my normal breathing. I could no longer sing like Joseph Shore. I lost my persona, my art, my profession, my self-image, my ability to make a living, all because of a surgeon’s incompetency. Then I knew what Jerry felt like; like all of a sudden you are not you anymore! Who can cope with that? I went from being Joseph Shore, one of the greatest baritones in the world, to being a semi-invalid with no ability to be me, and little ability to make any income. I suddenly understood the state of mind of my dear mentor and a man who had been a great world artist. All that saved Jerry was death. All that has saved me has been A Course In Miracles. Cherish the day you have. You have no guarantee of tomorrow. But this is not such a sad story for me. Since 2006 I have learned more about spirit and my abilities to work with spirit, which means my ability to help other people. Helping others is the way I escape despair. And it is better than just avoiding despair. I have had many episodes of Cosmic Consciousness, one of which lasted for six weeks!! Life is still beautiful. The sadness now, of no longer being Joseph Shore, the great opera singer, is a part of the happiness then! That’s the deal! And you can’t re-negotiate it; at least not until you pass over and have a good long discussion with the Lords of Karma. In the meantime, while I am still here, I try to help people. That’s my lot now. It’s not so bad. How Real Is The Near Death Experience? Since I have made it plain on this site that my path is ACIM, this question is pertinent. If the body is an illusion and the universe is an illusion, is the NDE an illusion? The Course uses ultimate terms for “reality.” To the Course, Heaven is the only reality. All else is illusion. In this sense, the NDE is an illusion too, though a very different one than our daily world in the body. Since we are minds (spirits) rather than bodies, the Course has no difficulty in accepting that the mind (spirit) can be “apart” from the body since the body is never real anyway. At the event that we call physical death, the mind (spirit) of the person is still just as it was when it believed itself to have a body. It still has its lessons to learn and still retains its illusions. Nothing has happened except the inherently illusory body has been dropped. Many NDE-ers have gone all the way into death of the body, as measured by this world. They come back with quite a story and some personal changes. Those who worship the Ego and believe there is no life after the death of the body always try to find a way to disparage NDEs. That includes skeptical scientists who think there is no consciousness after the death of the body. The NDE is a big threat to them. But how “real” is it? That depends on how you view reality. From the point of view of those who think life in the body is real, NDEs are at least that real! But the Coursewould not call our life here on earth “real.” It is an illusion, a dream. So for the Course, NDEs are an extension of the illusion but in a different dream state. The worlds of Light the NDE-ers experience are very interesting but they are just as illusory as the so-called physical universe we live in now. Minds without bodies seem to create other bodies, astral bodies, celestial bodies, all as illusory as the physical bodies and all preserve some sense of separateness which is illusory. What about the all pervasive love they feel in these states? From the point of view of the Course, the physical body is the greatest barrier we have erected to the awareness of Love’s presence which is our natural inheritance. When the body is gone, it may well be that the mind is flooded with the love it was hiding from in the body. But minds can be wrong-minded or right-minded. Wrong-minded minds will surely continue in their wrong-mindedness after the body is dropped, and they may create wrong-minded dream worlds to appear to inhabit. Purgatory or hell states will be just as real for them as the celestial beings experienced by right-minded minds. What about the life-review that NDE-ers report? The Course would have no difficulty with that. We are told that we are responsible for our learning and that lessons we did not complete have to be retaken. What about meeting Jesus in these dream states? The Course would tell us that Jesus is now a symbol of the Love of God present within the mind of the sonship. What we know now about such “symbols” is that they PARTICIPATE in the reality they symbolize. They are not “nuda signas,” mere illusions. They have great power in the mind. Jesus as a symbol for the Love of God is active within the mind of the sonship regardless of the illusions of the sonship. When NDE-ers claim to encounter this Being of Love that they identify with Jesus they are doing just that in the mind. They are not meeting the historical Jesus but the Jesus who is an active symbol of the Love of God. What about the other beings NDE-ers claim to experience, like dead relatives friends or high beings? The Course has no trouble with the idea that disembodied minds meet other disembodies minds, and the illusion of separateness continues, so you can meet Aunt Sofie or Cousin Johnny. They are there in this new dream state that the mind has created since dropping their physical bodies. But even so-called “high beings” are as inherently illusory as us as separate beings. As long as there is the appearance of individuality and separateness, we are still in the dream. What about the report from NDE-ers that there are levels in the worlds they experience, some higher to God than others? The Course makes it very plain that there are no hierarchies in illusory states. What we can say is that those minds who have almost finished learning their lessons create a different dream world than those who are just beginning their lessons. This would account for all the so-called levels in spirit (mind).